This invention is designed to aid technique, support training and reduce strain on the wrists of rowers using an oar ( sweep rowing oars/ one oar per person). It can be used in connection with comfort and technical handgrips, which are currently in the market place) With this device, rowers are able to keep both hands stationary, while, using the usual technique where the outside hand feathers the blade, allowing the inside hand to stay fixed, without need reduce grip to allow the handle to rotate inside. Additionally, this can help to reduce sore hands, blistering, wrists strain and possible tendonitis for the user. 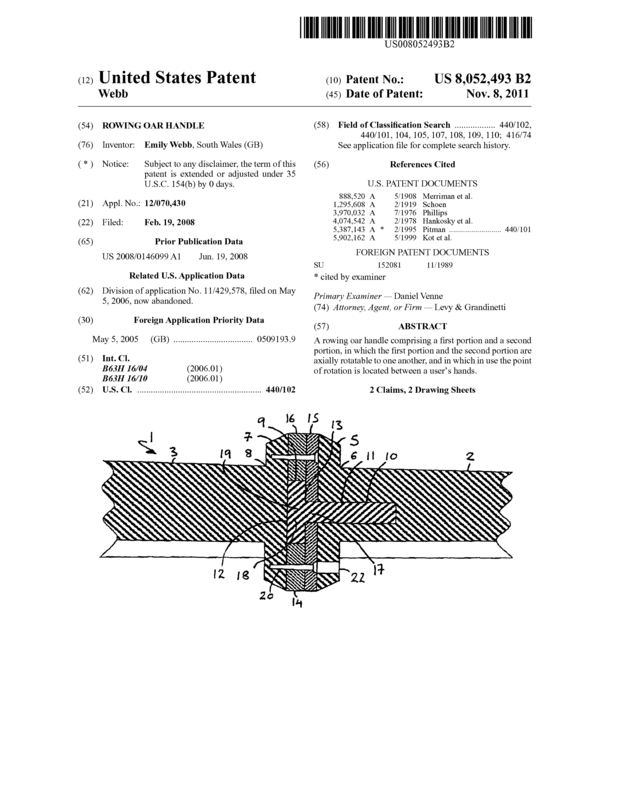 Samples, prototypes and tooling available with this patent. We'd welcome the opportunity to discuss further. Some additional information: A rowing oar handle 1 comprises a first portion 2 and a second portion 3, in which the first portion and the second portion are axially rotatable in relation to one another, and in which the point of rotation is located between the regular positions of a user. We are looking for opportunities! Open to an outright sale, licensing or partnership and are keen to move swiftly. This has not yet been available on the market, but samples, prototypes and hard tooling is available and in the UK with a potential manufacturer ready. Happy to discuss market potential directly. Page created at 2019-04-25 17:58:17, Patent Auction Time.